As you use your science and art to grow fruit and vegetables, we are there to create a simplified certification process that helps you to really focus on your passion. 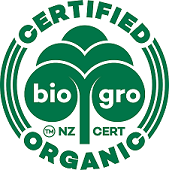 Whilst you apply your knowledge, skills and technologies to grow foods, we are with you every step of the way allowing you to do this with organic certification. Zealong Tea is widely regarded as a Waikato icon, and the only commercial tea estate in New Zealand, producing international award-winning, certified organic, New Zealand-grown tea.